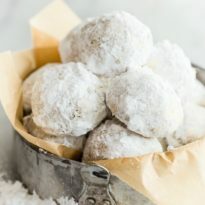 These easy Mexican Wedding Cookies have walnuts in the dough and are rolled in powdered sugar so they look exactly like snowballs! Perfect for Christmas. Adjust two oven racks to the upper middle and lower middle positions and preheat to 325 degrees. Line 2 baking sheets with parchment paper or silicone mats. In a food processor or grinder, finely grind 1 cup walnuts, about 10 to 15 seconds. Transfer to medium bowl. Coarsely pulse the remaining 1 cup walnuts in food processor, about 5 seconds. Transfer to medium bowl with finely ground walnuts. Stir in flour and salt and set aside. In a standing mixer fit with the paddle attachment on medium speed, or with an electric mixer, beat butter and superfine sugar together until pale and fluffy. Beat in vanilla. Reduce mixer speed to low and gradually add flour mixture until combined, about 30 seconds. Scrape down the sides of bowl and beaters and continue to beat until the dough comes together, 5 to 10 seconds longer. Working with 1 tablespoon of dough at a time, roll into 1 1/4-inch balls and arrange 1 inch apart on prepared baking sheets. Bake until cookies are lightly golden brown, about 18 minutes, rotating baking sheets after 9 minutes. Remove from oven and cool cookies on baking sheets for 10 minutes, then transfer to a wire rack and cool completely, about 1 hour. Roll cookies in powdered sugar. Just before serving, re-roll cookies in powdered sugar. Gently shake to remove the excess. The cookie dough can be wrapped tightly in plastic wrap and refrigerated up to 3 days in advance. Soften at room temperature before proceeding with Step 4. How to make Superfine Sugar: Place 1 cup sugar into a food processor and process for about 1 minute. I used 1 cup sugar to make 1/3 cup superfine sugar.